MARLBOROUGH, Mass. and ROCHESTER, Minn. – Boston Scientific Corporation (NYSE: BSX) and Mayo Clinic today announced a continuing collaboration where the two organizations share intellectual property and stimulate the rapid development of medical devices to address unmet clinical needs. 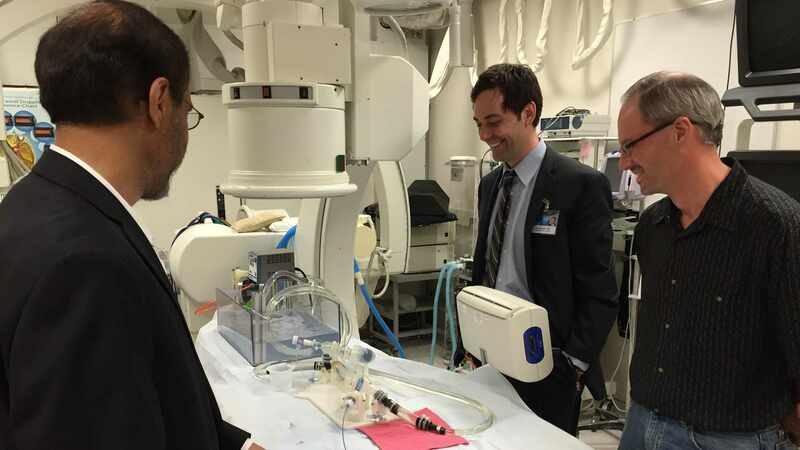 Small and nimble teams of Boston Scientific engineers and Mayo Clinic physicians have been working together to develop new medical technologies in areas that include interventional cardiology, heart rhythm management, endoscopy, neuromodulation, urology and pelvic health. The collaboration enables both parties to contribute ideas and intellectual property to solve pressing medical problems and builds upon the strengths of both parties. Mayo Clinic, which cared for 1.3 million patients in 2015, offers cutting-edge medical and surgical expertise in all disciplines, and has a long history of innovative clinical research and technology development. A guide catheter designed to enable a physician to pass a guidewire across a narrowed aortic valve as part of the procedure for catheter-based aortic valve replacement. In the current procedure, physicians may struggle to feed the wire across the stenotic valve’s strong current of blood. Doing so can increase procedure time, a patient’s exposure to X-rays and even cause damage to the valve and arteries. It may also dislodge plaque that could result in a stroke. The catheter design shows promise in positioning the guidewire more easily during the procedure. Use of the Boston Scientific Precision Spectra Spinal Cord Stimulator System to block the neural signals that trigger shortness of breath and muscle fatigue during exercise among patients with heart failure. This study will evaluate if blocking signals from organs to the brain can moderate control of the heart and vasculature for these patients. In the U.S., the Precision Spectra System is indicated as an aid in the management of chronic intractable pain of the trunk and/or limbs, including unilateral or bilateral pain associated with failed back surgery syndrome, intractable low back pain and leg pain. The collaboration is being managed through Mayo Clinic Ventures, which serves Mayo Clinic by finding partners that can bring Mayo’s inventions to the marketplace to improve medicine everywhere. Mayo Clinic Ventures’ mission is straightforward: Commercialize Mayo Clinic technologies for the benefit of patients worldwide while generating revenue to support clinical practice, research and education at Mayo Clinic. Mayo Clinic has a financial interest in the technology referenced in this news release. Mayo Clinic will use any revenue it receives to support its not-for-profit mission in patient care, education and research. Boston Scientific transforms lives through innovative medical solutions that improve the health of patients around the world. As a global medical technology leader for more than 35 years, we advance science for life by providing a broad range of high performance solutions that address unmet patient needs and reduce the cost of healthcare. For more information, visit http://www.bostonscientific.com, and connect on Twitter and Facebook.